They’re all that’s between you and feeling absolutely claustrophobic in your new college space. Okay I exaggerated a little! Dorm rooms probably aren’t tiny enough to make you feel claustrophobic. But they sure can feel cramped! When it’s you and another person confined to keeping ALL of your combined things in one place, you realize very quickly how limited your space is. Luckily there are a number of ways to to make the most of it! Being organized is going to be your number one weapon against the the battle of the never ending stuff. 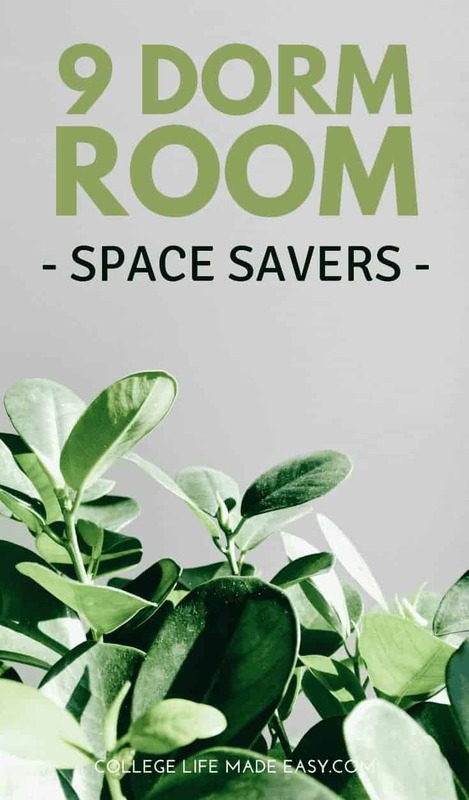 So in today’s post I put together this list of ideas for dorm space savers. TIP: Make sure your dorm room can accommodate these ideas BEFORE making a purchase. When living in a dorm, it’s even difficult to have enough room to be messy. If there is no room to expand then, there is only one way to go: up! 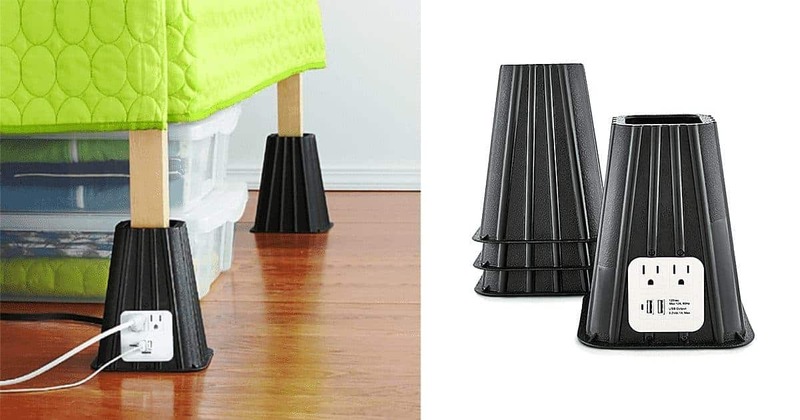 Bed risers will give you extra room for storage under the bed. Before you go out and buy some, you’ll want to check to see if bed risers are compatible with your dorm. Some dorms have bunk beds or have the beds already raised – making bed risers unnecessary. Bed, Bath & Beyond has a handy tool where you can search for your school to see what they provide, as well as what’s prohibited in the dorms. If you do end up getting a set of risers, why not opt for bed risers that have outlets? Because another thing you’ll have a shortage of, besides space, is outlets. Now with more space under your bed, you can find organizational uses for it. Like under the bed drawers or storage bags. Inside these drawers, you can keep your extra stuff. These are especially great for storing things that don’t get everyday use. Think items such as: extra bed sheets, seasonal clothing or a first aid kit. There are a lot options when it comes to under the bed storage! Choose what will fit your needs best. As a woman, I love shoes! And not even stereotypically. If I didn’t have good self control, a lot more of my paycheck would go to getting new pair of shoes. Shoe organizers have organizational uses that go beyond just shoes. 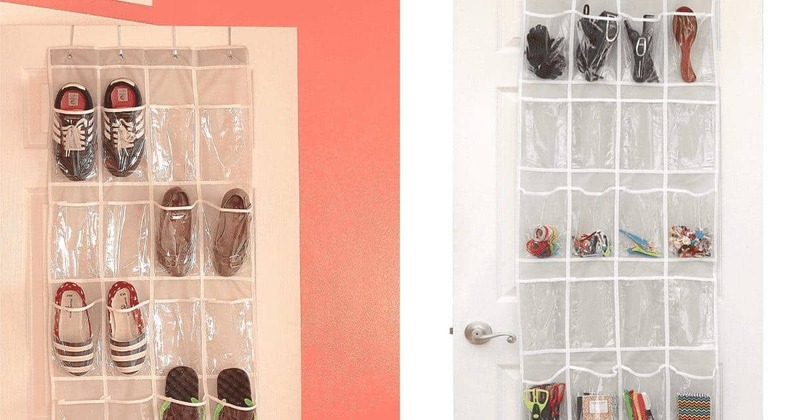 An over the door shoe organizer makes use out of the unused space on the back of a door. Fill the pockets with socks, snacks, accessories or really whatever you can fit in them. Ranging from 2 to 10 pockets, these are your best companion when in bed – aside from your sheets and pillows that is. Created with awesome ingenuity, beside pocket organizers simply slip under your bed mattress to support themselves. They can hold hold mobile phones, tablets, eyeglasses, magazines and more. A bedside caddy operates under the same idea, it’s just smaller and more compact. Either way, they are useful dorm space savers. Honestly the convenience of not having to get out of bed makes one of these bad boys extra worth it to me. You can even make one yourself! This is a guide that involves sewing and this one involves no sewing. You only have SO much space under your bed. Remember how I said the only way left to go was up? 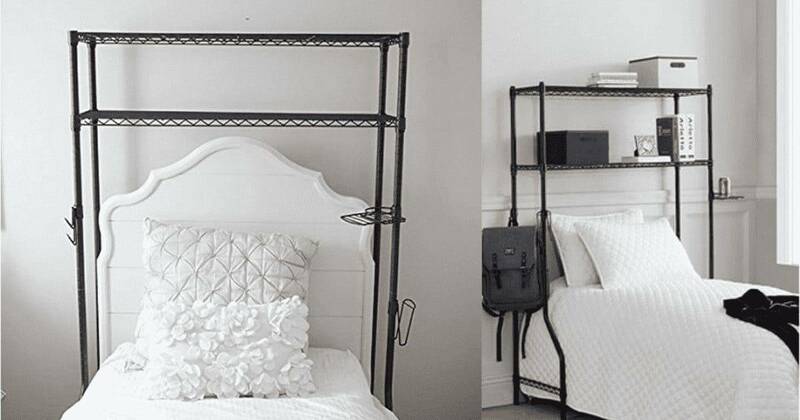 Well, an over the bed shelf can super helpful as a dorm room space saver. It can even double as a bathroom shelf when you move out of the dorms, too. This next idea for dorm space savers is not only useful for organization, but also so cute! 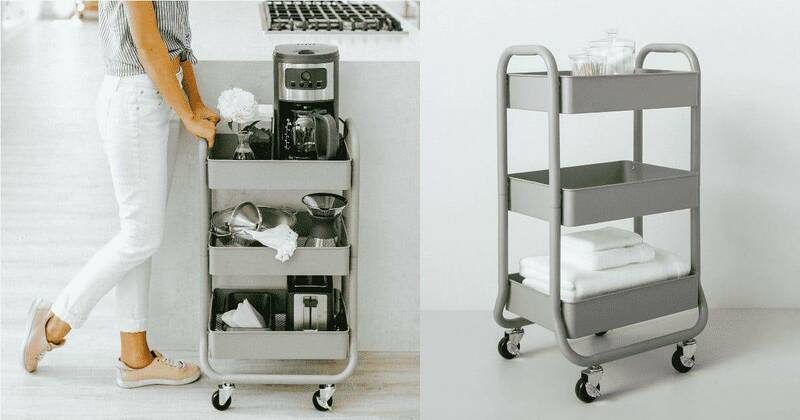 With three tiers, a utility cart can hold A TON. It’s on wheels, making it super easy to move around. Use it as a coffee station/snack station or to hold your bathroom supplies. Stuff that really doesn’t have it’s own place will be right at home (and easy to access) on a utility cart. 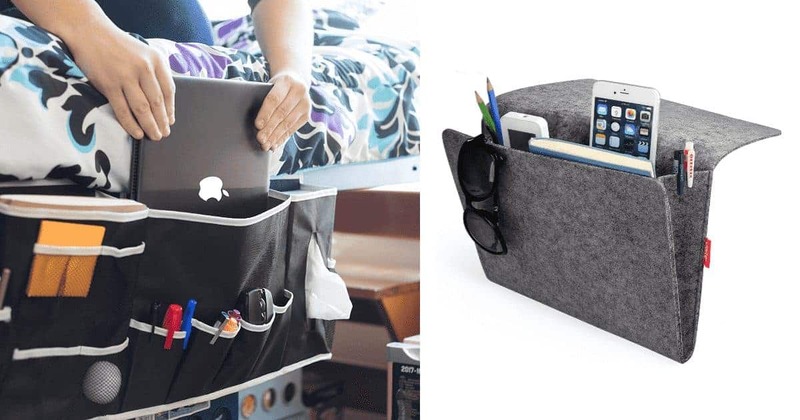 This is a sneaky way to save space in a college dorm room. Use a storage ottoman (or a bench if you have enough room) to hold blankets, snacks, electronics cables or whatever! The cat rule of “if it fits, I sits” applies perfectly here. 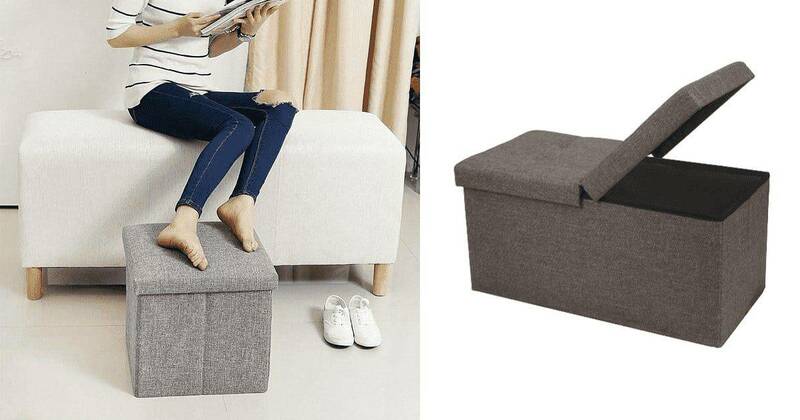 It has twice the uses, one as secret storage and the other as a place to sit/rest your feet. Win – win! 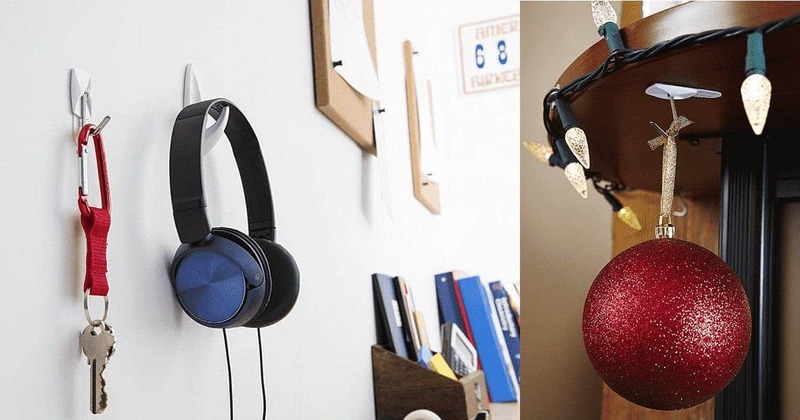 Command hooks – I don’t think they really need much of an explanation as to why they can be helpful in dorm rooms. They’re simply good for hanging stuff (keys, jackets, string lights, etc.) and all without damaging the walls! 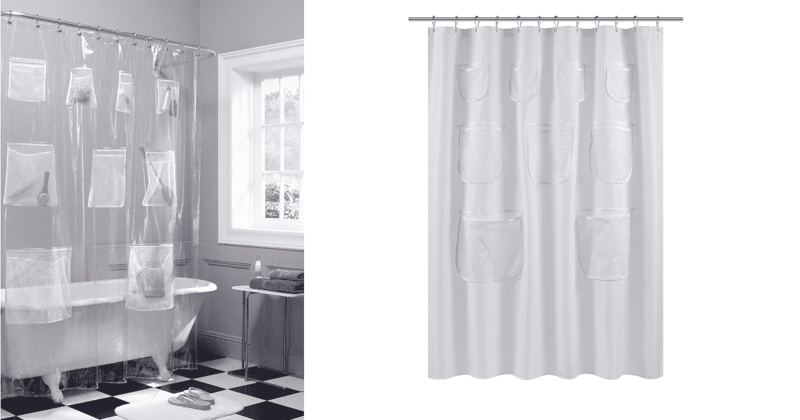 My final dorm space saver idea is a shower curtain with pockets on the outside. This will only be of use to you if you have a private bathroom for your dorm, instead of a communal bathroom. 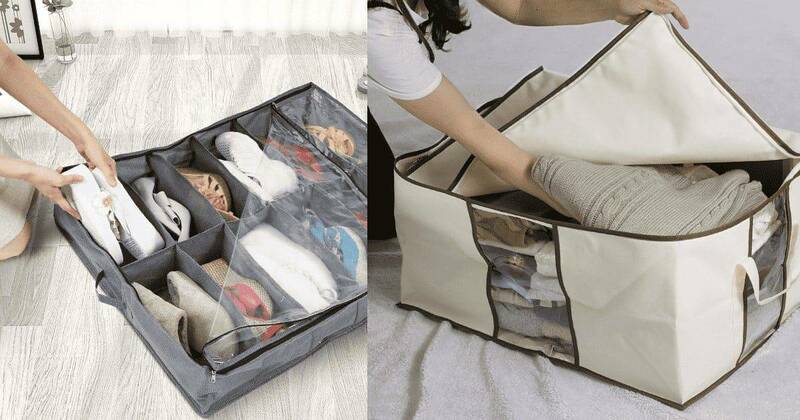 Just like an over the door shoe organizer, it has lots of pockets! Amazing for organizing cluttered counters and holding personal care items. Got any more ideas for dorm space savers? Tell me which ones you liked best! Or, let me know which ones you think are totally useless. 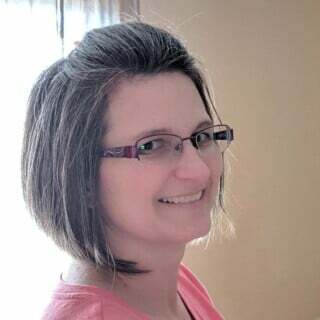 Either way, I’d love to hear your thoughts! Only 56¢ Per Trident Gum Pack at Walmart - Stock Up for Back to School! I really need to check out a desk bookshelf. Thanks for the tips! Glad you found some value!